The Portsmouth Bypass is on schedule for completion in December. A very large concrete beam makes its way through Portsmouth Thursday afternoon, as bridgework is still being completed on the Portsmouth Bypass. The Portsmouth Bypass is on schedule. 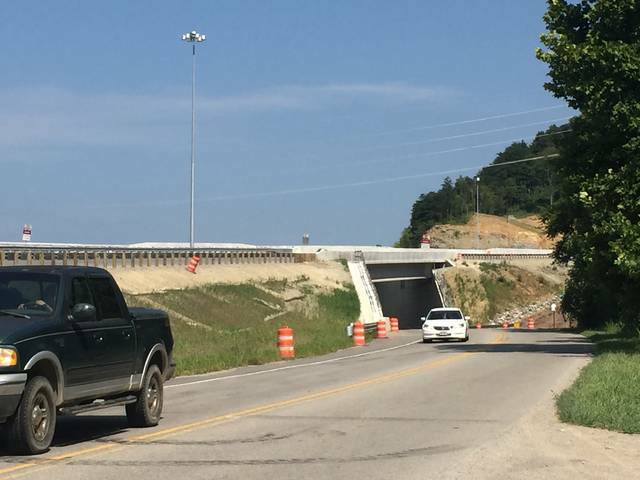 In early March, Ohio Department of Transportation District 9 spokesperson Kathleen Fuller told the Daily Times construction of the Southern Ohio Veterans Memorial Highway, often referred to as the “Portsmouth Bypass,” was nearing the finish line. “We are ahead of schedule,” Fuller said back then. “I’m not ready to say how far ahead.” She indicated she might be able to give a project completion date by late spring or early summer. Asked by the Daily Times for an update on the project, Fuller said Wednesday she could only promise it will be finished by the contract completion date of December 14, 2018. Fuller added work may be done prior to that date but she can’t say for sure. 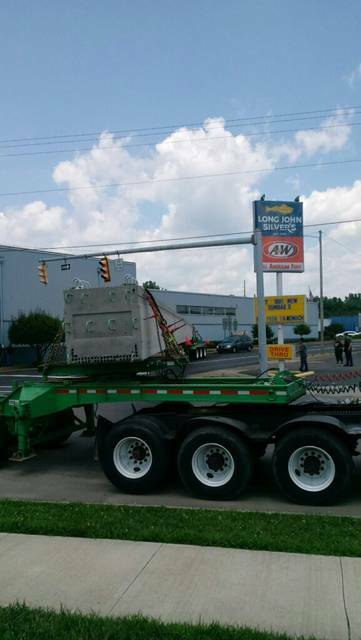 Stretching 16 miles and connecting U.S. 52 in Wheelersburg to U.S. 23 north of Lucasville, the $634 million project has been advertised as the largest piece of earthwork ever undertaken in the state. According to the District 9 website, the project required removal of 20 million cubic yards of dirt. As of March, Fuller reported the earthwork as 100 percent complete. At the time, she called the overall project about 87 percent complete. Speaking recently, Fuller did not speculate as to what percentage of the highway is ready. “We’ve gotten a lot done, but we have a lot to do,” Fuller said. She mentioned bridge building, guard rail installation and striping as some of the work remaining. As part of the ARC’s mission, the S.R. 823 project was developed to end supposed isolation of certain areas and provide roadway connections believed needed to attract economic development and jobs. Fuller said the motivations for building the freeway remain similar to those discussed back in the ‘60s. She said the roadway is meant to open new areas for development, not just in Ohio but also in West Virginia and Kentucky. As one local example, Fuller talked about Scioto County officials adding new infrastructure to the area around the Scioto County Airport to make that area attractive to future commercial activity. Again, back in March, Scioto County Economic Development Director Robert Horton did indeed talk specifically about work being done around the airport to take advantage of the coming highway. At the time, Horton added the county and the Southern Ohio Port Authority are not finished wheeling and dealing to take advantage of the coming freeway. “We’re going to continue to fish and bait and something is going to happen, and you can’t say what but it’s going to be exciting,” Horton said. Fuller said that significantly the new highway will have no grade level access. All access will be via various interchanges. In other words, there will be no direct access to the highway from other streets or state routes. Drivers coming from, say Columbus, will not encounter cars or trucks entering or crossing the freeway from side roads or come across any stop signals. Further, there will be no variations in speed limit. Traffic will be able to travel the new highway at 70 mph from one end to the other. “This is by no means meant to cut off Portsmouth,” Fuller insisted. For his part, Horton seemed convinced the bypass will help, not hurt Portsmouth. He and other local officials pointed to an ODOT study they said showed 90 percent of highway traffic cutting through the city doesn’t even stop here. “The only thing you’re going to lose is a few truck drivers,” Horton said. As has been highly publicized in the past, the new freeway is the first ever public/private road enterprise in Ohio. Fuller said had the state decided to build the project on its own, it most likely would have been built in phases stretching over 15 to 25 years. The unique funding mechanism used cut that time to three-and-a-half years. According to Fuller, it also means contractors largely are responsible for upkeep of the highway once it opens in December. ODOT only will be responsible for snow removal.